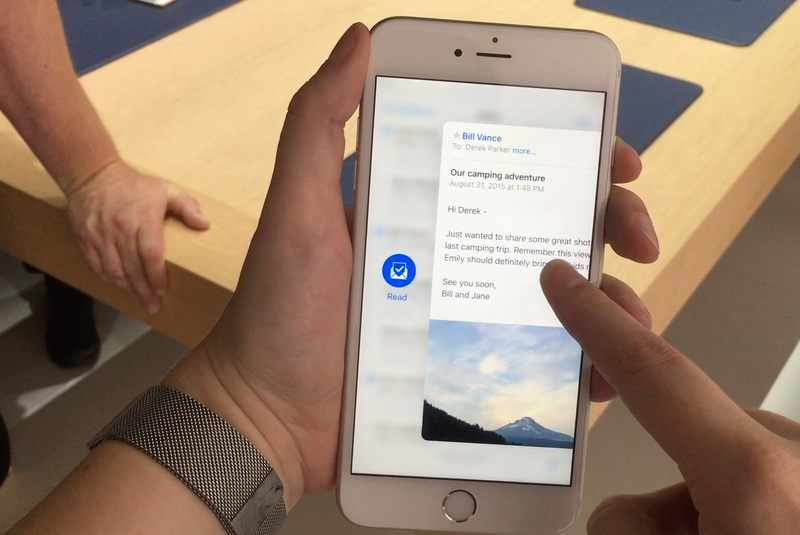 Its Live Photos and 3D Touch are especially delightful. “The only thing that’s changed is everything,” Apple said about the new iPhone 6s and iPhone 6s Plus at Wednesday’s Apple event. That’s both true and untrue. The case looks pretty much the same, the screen sizes didn’t change, and the entry-level model still has a paltry 16GB of storage. But inside it’s an all-new iPhone with some impressive new capabilities. I got hands-on time with the new models, and even though the presentation didn’t blow me away, the new 3D Touch and Live Photos features deliver a delightful experience. “What is a picture?” pondered Phil Schiller on stage. After more than an hour and a half of keynote, this wasn’t a philosophical debate I was excited about having. But he had a point: A photo is a still image of a moment, but a moment can have a beginning, middle, and end that one frame can’t always fully represent. Enter Apple’s new Live Photo feature. It's on by default in the main Camera app, and if you leave it on, it automatically captures 1.5 seconds of, er, moments before and after your shutter press. Flipping through the Live Photos in the Camera Roll, you’ll see just a glimpse of the animation—it's just enough motion to let you distinguish a Live Photo from a standard one. When you press harder on a Live Photo (a maneuver Apple calls 3D Touch on the new iPhones), you’ll see the full three seconds of motion. I have a 3-year-old, and a lot of my photos of him wind up blurry because at least some part of his body is in motion virtually all of the time—the boy is a walking wiggle. I don’t think you get to scrub through a Live Photo frame by frame and pick out the single still image that’s not blurry, but getting to see an animation of one of his wiggles would beat any blurry photo, or a picture where his eyes are closed. Developers will get to use Live Photos too—Facebook is working on supporting Live Photos, aiming to finish by the end of this year. But even if they never leave the iPhone itself, Live Photos are just delightful. 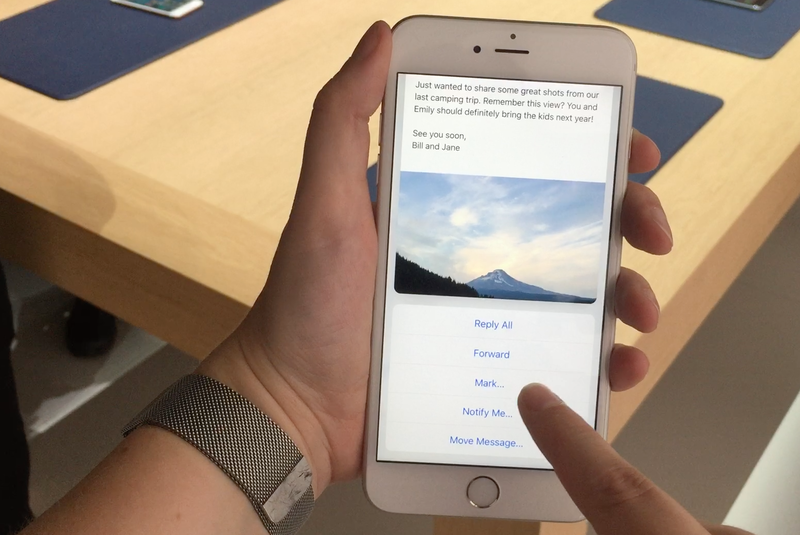 You can even use one as your lock screen wallpaper, and then 3D Touch it to make it move. 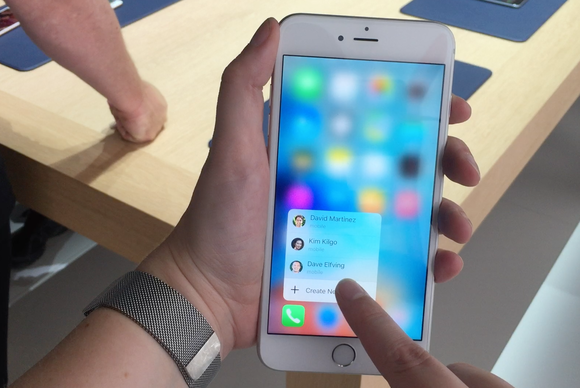 3D Touch, you ask? 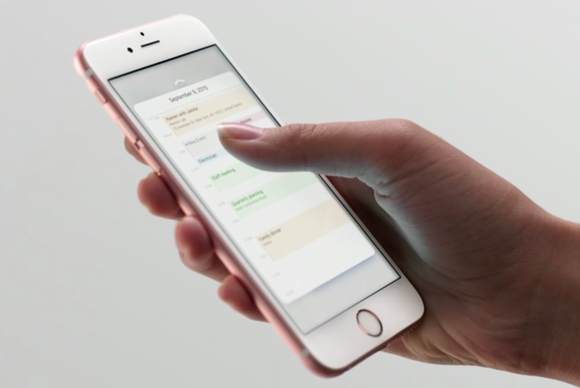 Yup, that’s the other big feature exclusive to the iPhone 6s and 6s Plus. It works just like Force Touch on the Apple Watch—you press harder, like you’re trying to push right through the screen, and that’s a different kind of touch than a regular swipe or tap. This will let you interact with apps (from Apple and third parties) in new ways. 3D icons on the home screen for some quick shortcuts, like to your three most recent contacts. For example, you can 3D Touch icons on the home screen for shortcuts to certain features: The Facebook icon hides shortcuts for changing your status or checking in, while the Camera app’s icon holds options for taking a selfie or shooting a new video. If you attempt to use 3D Touch on an icon that doesn’t support it (like Health), you’ll see the icon pop a little to let you know that the 3D Touch did in fact register, but nothing else is going to happen. Here's the "peek," a preview of a Mail message. Don't lift your finger or it'll go away, so not quite as handy as Quick Look in OS X, for example. 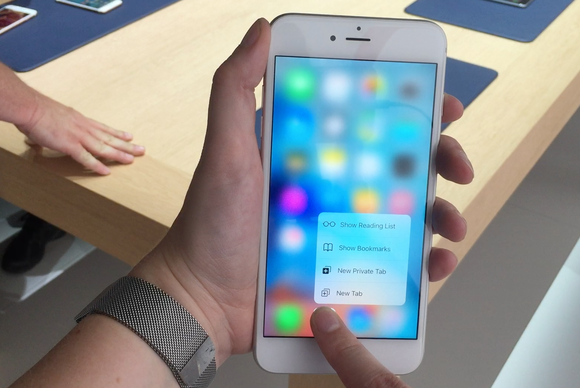 3D Touch gets even cooler once you open apps. You can use it to preview a new message in Mail, but it’s not quite as handy as Quick Look in OS X, because the preview disappears when you lift your finger back off the screen. During my hands-on time, I found myself 3D Touching a message, and then lifting my thumb to see what it says. But of course, the message preview vanishes, so I 3D Touch it again. And again, and again. It would be quicker to just tap the message to open it. Swipe the peek right to mark a message as read, or left to delete it. The action happens the second you lift your finger. But the preview isn’t really for reading, it’s for quick triage. Apple calls the first preview the “peek,” and if you don’t lift your finger, you can swipe up, left, or down for options. Swipe right to mark the message as read—you’ll see a Mark As Read option as the preview slides to the right to remind you what will happen when you lift your finger. Swipe left to delete the message. Swiping the message up produces buttons to reply, forward, flag, remind you about the message later, or move it elsewhere. Since you need to tap those buttons separately, the swipe-up move does fix the preview window in place. Swipe the preview up for the rest of your options. Now you can lift your finger in order to tap one of these buttons—the preview will stay onscreen while you decide. After the “peek,” if you continue to press hard, you’ll open the message, a move Apple calls the “pop.” If you peek and don’t pop, the message doesn’t get marked as read, so peeking in is a quick way to see if an email is the droid you’re looking for without having to go back and mark it as unread if it wasn’t. 3D Touch does tons of things in Messages, too: Hard-press a name for options to call, FaceTime, add to contacts, and so on. Hard-press URLs to peek at them, and again to pop into Safari. Hard-press street addresses to see them on a map, or dates to make a calendar appointment. This should prevent a lot of switching back and forth between apps when you’re making plans with groups of friends. Safari's Reading List will never be more than a 3D Touch away. 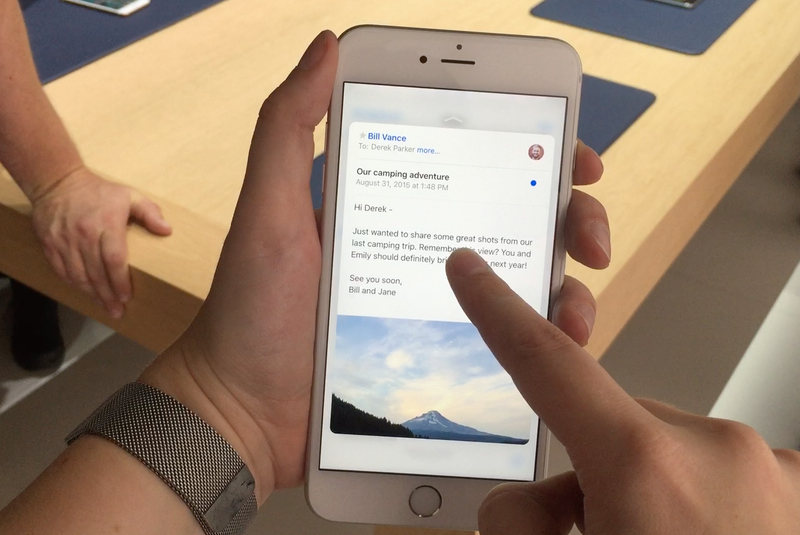 As with Live Photos, the 3D Touch feature is open to developers. For example, Facebook’s app icon has shortcuts to post a new status or check in right from your home screen. Instagram lets you 3D Touch everything, peeking into thumbnails and user profiles anywhere in the app. I asked if 3D Touch could be used to provide haptic feedback for an iPhone keyboard, and the rep didn’t think that was in the API just yet, but wasn’t totally sure. Still, even as it is today, I think 3D Touch has the potential to make Apple’s large-screened phones easier to navigate with one hand. Early adopters of the Apple Watch had mixed feelings about Force Touch on that device. It’s unbelievably handy, but not exactly intuitive—there’s definitely a long learning curve before your brain remembers where to Force Touch and what you’ll find once you do, since every app can use it differently. In my short hands-on time with the iPhone, I had the same problems, but hopefully once the iPhone 6s is in my possession full-time, 3D Touch will quickly become second nature. The iPhone’s rear iSight camera has been upgraded to 12 megapixels, and can shoot 4K video. 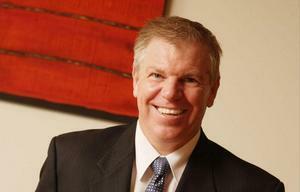 The improved FaceTime camera on the front can take 5-megapixel stills. I didn’t get to fully test either in the demo room, of course, but the shutter speed is crazy fast, and zooming in on the demo photos on each device revealed tons of detail. Panoramas are up to 63 megapixels now, and I love how their dedicated album in iOS 9 shows you the whole panorama in each thumbnail. Besides the new cameras, though, the hardware is nearly the same. The second-generation Touch ID home button works faster, according to Apple, so we’ll do some side-by-side tests when we get our iPhone 6s review unit. The new rose gold color is really nice in person, and Apple was smart to release it alongside a rose gold-colored aluminum Apple Watch Sport, so you can match colors without having to mortgage your home for a rose gold Apple Watch Edition. Rose gold is really pretty. The iPhone 6s and 6s Plus are ever-so-slightly thicker than the iPhone 6 and 6 Plus, but only by two-tenths of a millimeter, so definitely not noticeable when you’re holding them. Cases for the new phones should fit the old phones, and cases for the old phones should fit the new ones, depending on their design and materials. All the buttons and ports are in the same place, and so is the camera. Preorders start September 12, with the phones launching in the U.S. and 11 other countries starting September 25. We’ll have a full review up as soon as we can—post your questions in the comments and we’ll do our best to answer them!